Gossip is as old as communication and no workplace is immune from it. Gossip tends to be talk that gains attention for the speaker. The speaker will often adopt a confidential tone and he or she uses this information about somebody else to be the center of attention and will narrate the details in a way that tries to undermine the credibility or likability of thisn person. The details may be given with moralizing undertones and character assassination may be the top of the gossiper’s agenda. Often you are told more personal details than you care to know about. The motivations behind gossip include attention-seeking, self-inflation, exaggeration and me-versus-them mentality. Unlike Gossip, discussion involve talks about others and references to other people in general, friendly and supportive. The speaker is not obsessed with picking holes in another person’s character but is merely imparting information about what another person or people have done in a matter-of-fact, to further an objective, work-related conversation and to enlighten the listener about office relevant information. 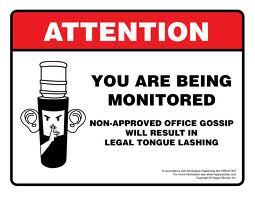 Some people gossip can be referred to as grapevine gossip, this pertains a general change occurring within a workplace. It’s started by someone and now it’s spreading like about like a wildfire. It’s always by some with silly wild guesses in his or her head. It’s less personal than gossip because it’s not attacking another person bit it’s equally damaging and demoralizing. Aisha: Have you seen Tunde this morning? Chinwe: What happened to him? Chinwe: What happened to his wife? is dating our Boss or what is she always looking for in this company especially when her husband is not around. She comes out of Oga’s office with her dress rumpled. Its bites me why someone just takes pleasure in destroying people with their tongue and how they come by all this stories. When a gossip spreader comes to me, I ask myself these question. Why is she telling me? Will the information benefits me? What’s in it for this gossip? If the answers to these questions are fuzzy, you can probably assume the news bearer is reveling in knowing something others don’t yet know. Such “news,” whether accurate or not, provides a momentary feeling of superiority and control that the gossip probably lacks otherwise. Unfortunately, a gossip isn’t satisfied just possessing the information. After all, knowledge that isn’t shared is wasted, right? How would others know the value of this soul unless the intelligence is disseminated? This is where others get implicated without necessarily being willing participants. Even the “innocent” are drawn in to the gossip’s web by merely listening. For a few fleeting moments, this person has everyone’s undivided attention, and this is “reward” enough. Gossips themselves might not immediately suffer for their loose tongues, but they will be found out. The consequences may include poor performance reviews, no pay raises, reprimands from supervisors, or possibly dismissal because of their involvement in destroying office morale or committing slander. Another tactic is to inform the gossiper that you are prepared to follow up the gossip. This will let the gossiper know the information is going back to the targeted person and the gossiper will either retract or apologize. If you are a natural gossip, keep yourself busy. Idle hands are the devil’s forked tongue. You get? This entry was posted in gossip, office, office and gossip, office gossip, relationship in the office, Uncategorized and tagged gossip in the office, office. Bookmark the permalink. When people gossip, it’s usually because they think they are morally better placed or materially above the subjects of their gossips. This of course has to do with the act of gossip and not the profession itself. Gossip however often provides a platform to understand others around you and to know what they will do or in fact say behind you. Guest Get Customized Gold Plated Iphone as Souvenir@ President Jonathan’s Daughter Wedding.